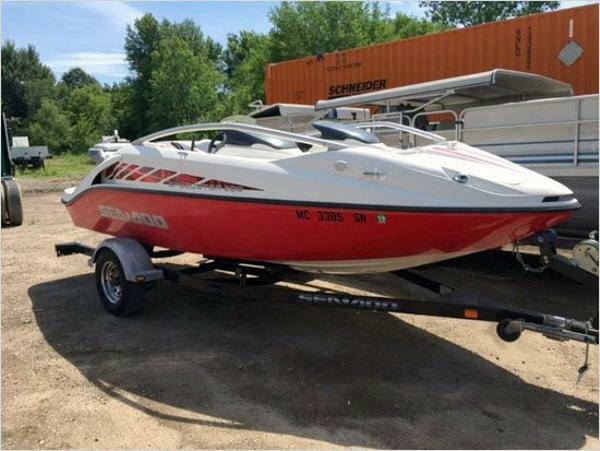 2007 Sea Doo Speedster 150. Supercharged 215 horsepower. 168 hours. Mostly fresh water usage. Factory Wake-board Tower. Wake-board Rack. Knee-board Rack. Hydro Turf. Tower includes Speaker and Light bar with 4 speakers and 4 lights. Quick release capable. Boat also has Underwater lighting. Dual battery added to support electronics. Seats have been professionally re-upholstered. Radio has been upgraded and a new Amp was put in this Spring. 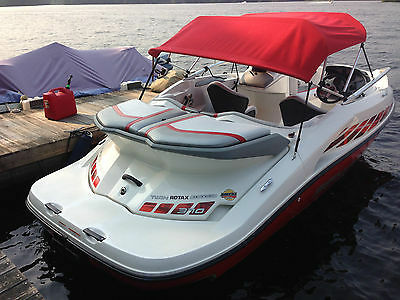 Includes SeaDoo OEM Trailer and Trailerable cover. New tires on trailer this Spring. Boat was professionally winterized and shrink wrapped. Had marine mechanic go through the boat and address any mechanical issues over the winter. Has normal imperfections you might see in a boat this age. Overall very nice condition. Selling because the kids are older and we don't have the time to use it. Can help with shipping. For sale locally so Auction may end for local sale. 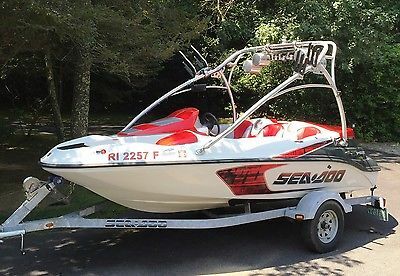 2005 SeaDoo Speedster 200, 20ft Jet Boat with Twin Engine 4-tec 370hp. Second owner bought in Red Wing, MN, Fast, sporty, and comfortable. This 370hp twin engine jet drive boat, Top end speed on radar 56mph. Great fun for skiers, tubers, and wake-boarders. Includes;2005 Karavan trailer. SeaDoo OEM mooring coverTwo anchorsLife jacketsFire extinguisherFlares This boat runs great, both wear rings where replaced last year, and always replaced oils at end of every season, superchargers have only 30hrs after been rebuilt, engines have only 165 hrs and no error codes, boat is ready for the water. If you have questions please ask prior to bidding. Boat is also for sale locally. 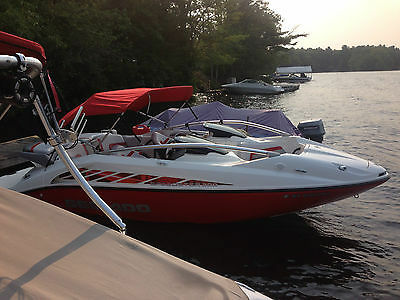 2005 SeaDoo Speedster 200, 20ft Jet Boat with Twin Engine 4-tec 370hp. Second owner bought in Red Wing, MN, Fast, sporty, and comfortable. This 370hp twin engine jet drive boat, Top end speed with 2 people and loaded with equipment is a thrilling 55mph, but this boat rides great at 35mph with 7 people, as well. Great fun for skiers, tubers, and wake-boarders. The trailer is a 2005 Karavan with spare matching wheel and all tires are a year old. SeaDoo mooring cover, two anchors and life jackets also included. This boat runs great, both wear rings where replaced last year, and always replaced oils at end of every season, superchargers have only 30hrs after been rebuilt, engines have only 165 hrs and no error codes, boat is ready for the water. If you have questions please ask prior to bidding. Boat is for sale locally so I may end the auction early. Used Sea Doo Bombardier Jet BoatModel year - 1995Model number - 5891Make - Bombardier Jet BoatBody Type - Class A Inboard BoatPropulsion - Jet PumpHull Material - Fiberglass reinforced plasticTwin engine, 4 cyclinder, 62.2 Horsepower HP each15 feetI have the title, original bill of sale, and recent repair recordsComes with trailerAs is conditionMotors were taken out of the boat because they need repairEngine compartment is cleaned outMotors can be reconditioned, I have a contact that rebuilds these standard Sea-Doo enginesFiberglass in good conditionLeather seats are in good conditionGood project type boatI have a list of recent repairs from a local repair shop that I can email or scan to you which includes cables, battery work, and other hardware upgradesI'm selling this boat as is with the trailerPlease email me any questions about the boat and I will answer them to the best of my ability. 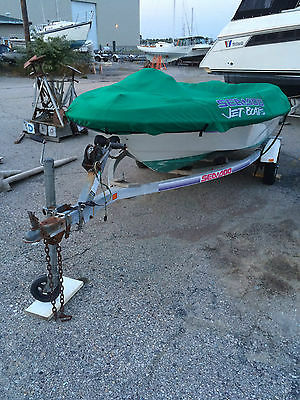 I am selling this boat on consignment for a local boat owner.